Hunting for a new place to live takes time but can be kind of fun. I know when my husband and I moved into our first home together we felt excitement and anticipation. We both had new jobs as well as a baby on the way so we definitely had a lot of changes to get used to. Of course, we had a lot of expenses to go along with those changes. Babies aren’t cheap and as we found out, neither is moving. For instance, we hadn’t planned on having to put all of our possession in storage for two months before we moved. In addition, we shelled out a few thousand to pay for movers since I couldn’t really lift much at seven months pregnant. Both of these situations added significantly to our costs and we hadn’t planned ahead for them. If you will soon be moving, whether for the first time or not, don’t get caught unprepared like we did. There could be some moving expenses you may not have thought about. You may be the most organized person in the world and the best at labeling everything, but moving is still going to be chaotic. The facts are that if you have very much stuff you are going to have boxes everywhere. Therefore, no matter how good your intentions are to cook right away in your new place it is unlikely you will be able to find everything you need for a few days. That means you will probably need to have food delivered or go out to eat. Eating out for a few meals is one of the moving expenses you may not have thought about ahead of time. But you can do yourself a favor by figuring that into your moving budget so you don’t spend more than you planned. Moving doesn’t usually happen in a day. Therefore, if you are leaving one job to move before starting the next you may have a loss of wages. It’s just one of the moving expenses you may not have thought about ahead of time. Maybe if you are lucky you will have time off built up from your current employer. That could soften the blow if they let you use it after your last working day. That way you are still getting paid for the days you took off to move. Either way it’s best to allow a little wiggle room in your budget just in case. When you move for the first time there likely won’t be as much to move. That can be to your advantage because you may be able to skip renting a truck. However, if that’s not the case you can beg friends or bribe them with pizza. But if that doesn’t work either then you will either have to hire movers or rent a truck. Make sure you plan for these fees before you move. Whether you are moving across the country or just a few blocks everything still has to go in the truck. Then it has to be removed, box by box, before unpacking begins. Hiring a moving company can make that process much easier. Yet, if you need to keep your expenses down, don’t expect this bill to help. Furthermore, it may be one of the moving expenses you may not have thought about. 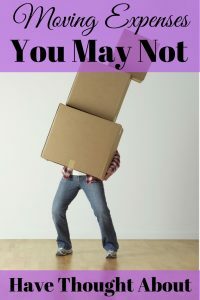 You should know that some moving companies will charge based on the weight of your belongings. If yours does it is possible the final bill will be higher or lower depending on the accuracy of the estimate you will be given. One of the moving expenses you may not have thought about is extra moving fees from your moving company. That’s why it’s better to inform your moving company in advance about any difficulties they may have loading and unloading your possessions. Examples include lots of stairs to go up and down at either location or parking difficulties a large truck could experience. Another of the moving expense you may not have thought about is packing materials. While I believe in being as frugal as possible and not paying for boxes not everyone agrees with this philosophy. Whenever my family has moved we saved paper boxes or picked them up free from office supply stores or printing businesses. We also snagged nice moving boxes from liquor stores, grocery stores, or other retail locations. Sheets, towels, blankets, pillows, and other soft items were used to cushion breakable items as we packed. But if you would rather pay for boxes, stuffing, and tape just don’t forget to include them in your budget. It’s better not to store your things in a storage locker if you can help it. You will end up with another bill to pay each month until you empty it and that is a waste of your hard earned money. Besides, things often get broken and may even become damaged by pests. However, if you don’t have a choice, try to get an airtight shipping crate instead of a storage locker if you can. Either way this is a moving expense you may not have budgeted for. No matter how you slice it moving is going to cost you some money. But even the most frugal of people may not consider every expense. Consider these moving expenses you may not have thought about on your own before you move. If you haven’t planned ahead for these expenses, you might look into installment loans in order to pay for them as part of your monthly budget. What other moving expenses sometimes get overlooked?